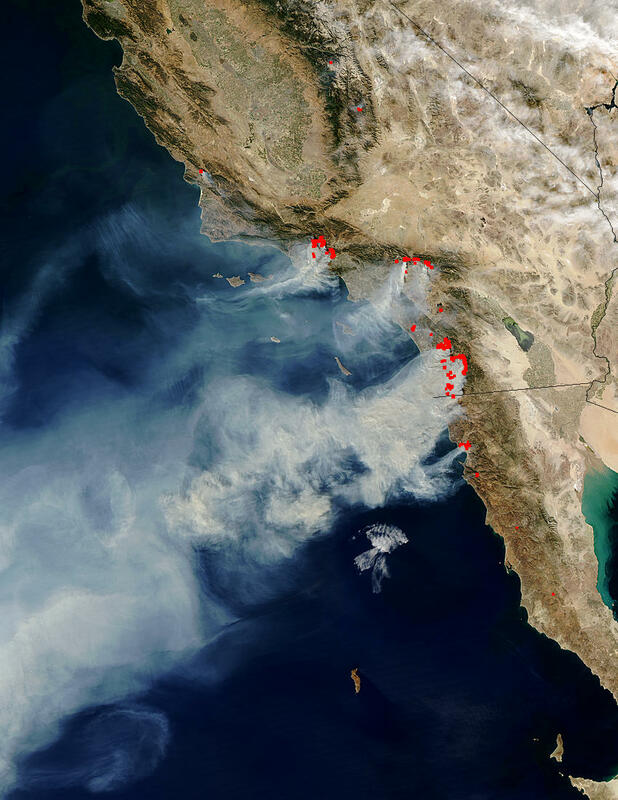 Ten large fires rage across southern California in this true-color Moderate Resolution Imaging Spectroradiometer (MODIS) image taken on October 27, 2003 by NASA’s Aqua satellite. Starting in the north, the first cluster of red dots is a combination of the Piru, Verdale, and Simi Incident Fires, which have burned a combined 113,680 acres of land. The next line of dots consists of the Old, Grand Prix, and Mountain Fires. The small cluster closer to the coast is the Roblar 2 Fire. Going south, the Paradise Fire (top), the Cedar Fire (center), and the Otay Fire (bottom) form a massive veil of smoke over San Diego. Overall, well over 200,000 acres have burned in the fires.